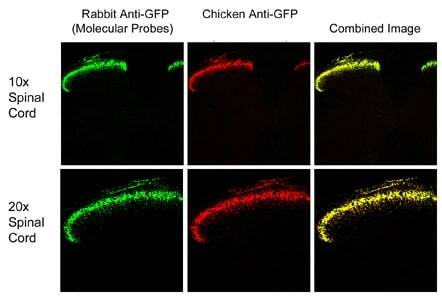 Chicken polyclonal GFP antibody. Validated in WB, IHC, ICC/IF. Cited in 1298 publication(s). Independently reviewed in 83 review(s). Immunogen corresponding to recombinant full length protein. WB: Mouse lung normal tissue lysate - total protein (ab29297), Transgenic mouse spinal cords. 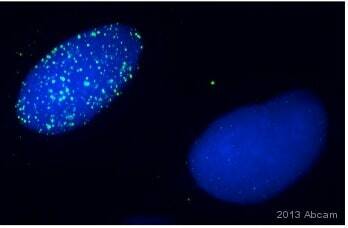 ICC/IF: GFP-transfected NIH/3T3 cells. Shipped at 4°C. Store at +4°C short term (1-2 weeks). Upon delivery aliquot. Store at -20°C. Avoid freeze / thaw cycle. Our Abpromise guarantee covers the use of ab13970 in the following tested applications. IHC-P 1/500 - 1/1000. Perform heat mediated antigen retrieval before commencing with IHC staining protocol. The concentrations of fixative for the IHC applications were typically 10% formalin or 2% paraformaldehyde. IHC - Wholemount Use at an assay dependent concentration. Used at a dilution of 1/2000 for 1 hr (see Abreview for further information). Immunohistochemistry (Formalin/PFA-fixed paraffin-embedded sections) - Anti-GFP antibody (ab13970)Dow et al PLoS One. 2014 Apr 17;9(4):e95236. doi: 10.1371/journal.pone.0095236. eCollection 2014. Fig 5. Adenoviral Cre induces mosaic activation of rtTA and GFP induction in CAGs-LSL-rtTA3 and CAGs-LSL-RIK animals. Immunofluorescent stains for GFP and mKate2 in lung sections of triple transgenic mice (CAGs-LSL-rtTA3 or RIK;TG-Ren.713;LSL-KrasG12D). KrasG12D-induced lung adenomas show strong expression of GFP and mKate2. Lower panel: Higher magnification of the lesion. White arrows indicate rare cells that show mKate2, but not GFP expression. Western blot - Anti-GFP antibody (ab13970)Image is courtesy of an AbReview submitted by Dr Francois Daubeuf. Lysates/proteins at 5 µg per lane. Cells were treated by mixing in RIPA buffer and denaturating in Laemmli buffer for 5 minutes at 95°C. The gel was Precast at 4-12%. Blocking was with 0.5% milk at 20°C for 5 minutes. 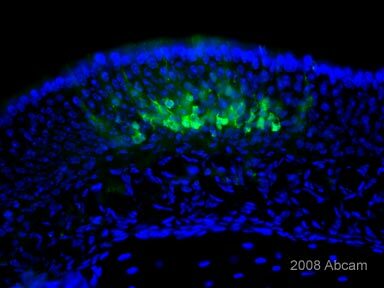 ab13970 staining mouse olfactory bulb tissue sections by IHC-Fr. Sections were PFA fixed, permeabilized in 0.4% Triton-X and blocked with 5% serum for 2 hours at 25°C. The primary antibody was diluted 1/1000 and incubated with the sample for 16 hours at 4°C. An Alexa Fluor® 488 conjugated goat anti-chicken was used as the secondary. Immunohistochemistry (Formalin/PFA-fixed paraffin-embedded sections) - Anti-GFP antibody (ab13970)Image courtesy of an anonymous Abreview. 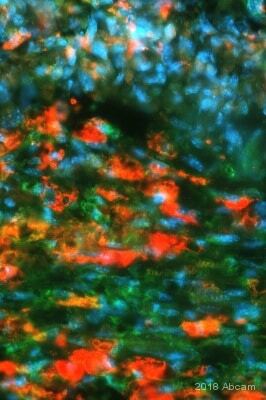 ab13970 staining GFP in murine lung tissue by Immunohistochemistry (Formalin/PFA-fixed paraffin-embedded sections). Tissue was fixed in paraformaldehyde and a heat mediated antigen retrieval step was performed using citrate buffer. Samples were then permeabilized with 0.1% Tween, blocked with 15% serum for 30 minutes at 23°C and then incubated with ab13970 at a 1/500 dilution for 14 hours at 4 °C. The secondary used was an Alexa-Fluor® 488 conjugated goat anti-chicken polyclonal used at a 1/500 dilution. Immunohistochemistry (PFA perfusion fixed frozen sections) - Anti-GFP antibody (ab13970)Image from Groner AC et al, J Biol Chem. 2012 Jul 20;287(30):25361-9. Epub 2012 May 17, Fig 1. 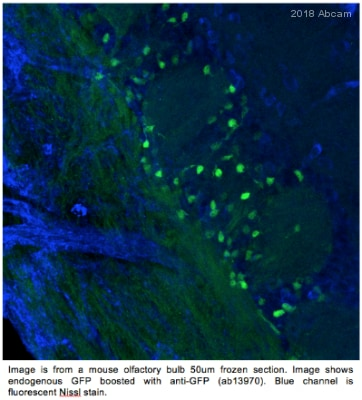 DOI 10.1074/jbc.M112.350884 July 20, 2012 The Journal of Biological Chemistry, 287, 25361 -25369.
ab13970 staining GFP in murine olfactory bulb tissue by Immunohistochemistry (PFA perfusion fixed frozen sections) Counterstained with DAPI. 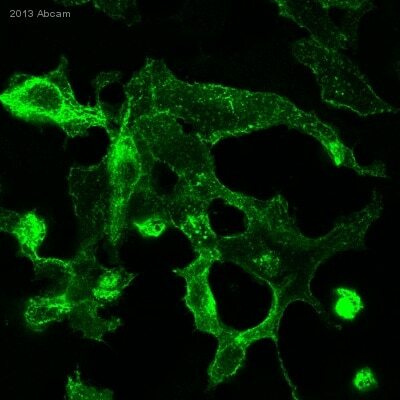 ab13970 staining GFP in U-2 OS (Human bone osteosarcoma epithelial cell line) cells by ICC/IF. Cells were paraformaldehyde fixed, permeabilized with 0.5% triton and blocked with 2% antibody dilution buffer for 2 hours. Cells were incubated with the primary antibody (1/1000) for 1 hour at 25°C. An undiluted Alexa Fluor® 488 conjugated Goat anti-chicken polyclonal was used as the secondary antibody. Western blot - Anti-GFP antibody (ab13970)Image courtesy of an anonymous Abreview. Lane 1 : Whole cell lysate prepared from HeLa (Human epithelial cell line from cervix adenocarcinoma) cells. Lane 2 : Whole cell lysate prepared from HeLa cells. Lysates/proteins at 25 µg per lane. 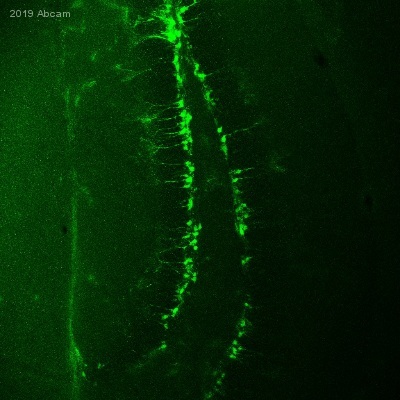 Transgenic mice expressing GFP selectively in lamina II of the spinal cord. ab13970 staining GFP in GFP-transfected NIH/3T3 (Mouse embryo fibroblast cell line) cells. The cells were fixed with 4% formaldehyde (10 minutes) and then blocked in 1% BSA / 0.3M glycine in 0.1%PBS-Tween for 1 hour. The cells were then incubated with ab13970 at 1/2000 dilution overnight at +4°C followed by incubation with Goat Anti-Chicken IgY H&L (Alexa Fluor® 488) preadsorbed (ab150173), for 1 hour, at 1 μg/ml. Under identical experimental conditions, when compared to the basal level of GFP expression in transfected NIH/3T3 cells, the cells upon which ab13970 was applied gave a stronger signal in the 488 channel, indicating that ab13970 is binding to GFP and therefore eliciting signal amplification. ab13970 was also applied to non-GFP-transfected NIH/3T3 cells, which produced no positive staining, indicating specificity for GFP. Nuclear DNA was labeled with 1.43 μM DAPI (blue). Western blot of transgenic mouse spinal cords showing that the rabbit anti-GFP (lane 1) and the chicken anti-GFP (Abcam; lane 2) recognize a band at the same molecular weight. ab13970 staining mouse olfactory epithelium tissue sections by IHC-Fr. The sample was PFA fixed and blocked with 4% BSA/ 5% NFDM/ 10% NDS for 15 minutes at 20°C. The primary antibody was diluted 1/1000 and incubated with the sample for 1 hour. An FITC conjugated goat anti-chicken was used as the secondary. This colony is the result of retroviral infection with a control virus. 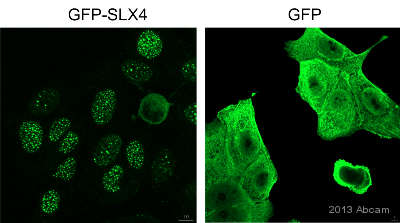 The GFP is under the control of an IRES promoter, so its expression is independent of any other protein. The counterstain is hoescht. 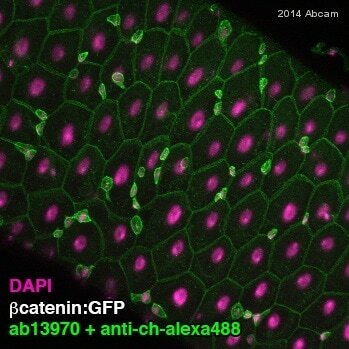 ab13970 staining GFP + tumor in mouse muscle cells by ICC/IF. Cells were formaldehyde fixed and blocked with 3% BSA for 1 hour at 24°C prior to incubation with the primary antibody (1/500) for 1 hour at 24°C. An Alexa Fluor® 488 conjugated goat anti-chicken was used as the secondary. ab13970 staining GFP in mouse brain tissue section by Immunohistochemistry (PFA perfusion fixed frozen sections). Tissue samples were fixed with paraformaldehyde and permeabilized with 0.1% Triton X100 before blocking with 10% serum for 30 minutes at 25°C. The sample was incubated with primary antibody (1/2000) for 16 hours at 25°C in 10% NGS in PBS + 0.1% TX100. An Alexa Fluor®488-conjugated Goat polyclonal to chicken IgG was used as secondary antibody at 1/400 dilution. 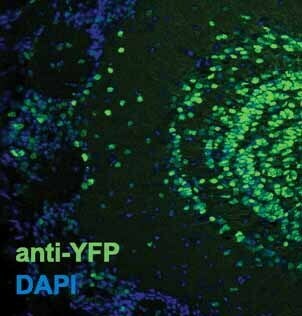 In the image, green staining represents GFP expressed in oligodendrocytes, blue is for ToPro3. Immunocytochemistry/ Immunofluorescence - Anti-GFP antibody (ab13970)Image courtesy of an AbReview submitted by Dr Francois Daubeuf. Immunocytochemical/ Immunoflurescence analysis of cytospined HEK-293 cells (Human epithelial cell line from embryonic kidney) transfected with GFP, labeling GFP with ab13970 at 1/200 incubated for 16 hours at 4°C with 1% BSA in PBS. Secondary used was a donkey anti-chicken polyclonal DyLight® 594 at 1/500. GFP is shown in red (DyLight® 594). Nuclei are counterstained in blue (DAPI). The left panel shows HEK-293 cells transfected with GFP and the right panel shows non-transfected HEK-293 cells. Publishing research using ab13970? Please let us know so that we can cite the reference in this datasheet.